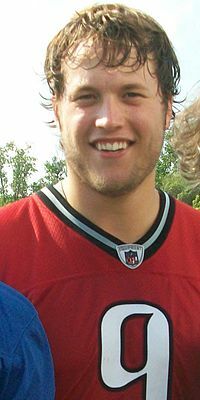 Being a Florida resident, prior to the Detroit Lions 31-14 victory over the Jacksonville Jaguars Sunday in Northern Florida, I haven't had the chance to watch QB Matthew Stafford perform in person. After all these games on TV, the boyish looking youngster, made a believer out of me, that as long as he stays healthy, the Detroit Lions "finally" have a Thoroughbred at this position. After toying with the Jags by amassing 285 yards, a lot of things came to mind about the 24-year old gifted Tampa native. * How much faster and younger would Stafford have hit the 10,000 (10,233) yard passing mark if he wasn't hampered by injuries earlier in his career? Would he already be second on the team's yardage list without the injury problems? Check my previous blog "Lions Mastery In Florida Continues" to see the team's all-time leaders. * Would Erik Kramer be amongst one of the all-time leaders in Lions passing yards that Stafford would be trying to surpass, if Detroit had kept him instead of pursuing Scott Mitchell, Dan Marino's backup with the Miami Dolphins? Kramer was the last Lions QB to win a playoff game crushing the Dallas Cowboys 38-6 during the 1991 season. * As the Lions continue to bolster the offensive line, wide receivers and running backs, would anyone even guess how many yards Stafford will amass when his playing days are over? * It's inevitable that Stafford and Lions Hall of Fame QB Bobby Layne will be No.1 and No.2 in passing yardage. My advice to the Lions is when they seek Stafford's eventual replacement, instead of scouting college teams, check back to Highland Park High School in University Park Texas, in the Dallas Metro Area, where they both played and draft their next star signal caller. Lions Hall of Fame Halfback/Punter Doak Walker also played at Highland Park High School. Two Hall of Fame Players from one high school with another potentially on the way. Enough said. * During the Lions post-game press conference, I was impressed with Stafford's attitude about reaching 10,000 yards indicating that he he simply didn't care about reaching that plateau. He was giving credit to the organization and his teammates. After speaking with his teammates in the locker-room, they're impressed as to how he quietly leads by example and has no ego whatsoever. He fits in well with Detroit's Blue Collar approach. 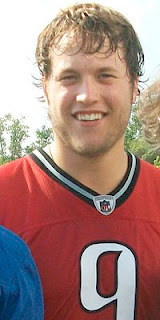 During many of his press conferences, Stafford is often seen wearing a Detroit Tigers Baseball Cap. He seems to have fit in and has embraced his new hometown. * I am still mind boggled that Lions Owner William Clay Ford Sr. gave Stafford a $40 Million signing bonus. But in this day and age, Ford knew that he had to. I'd be curious if Ford included a small piece of stock in Ford Motor Company. I have a feeling that Ford has no regrets especially after Stafford threw for 5,038 yards in 2011 and will shatter every franchise passing record by the conclusion of his career. * The Red Wings retired Gordie Howe's No.9 and although the NFL doesn't retire many numbers, I have a feeling that when Stafford's career is over, his number will never be worn again. The Lions also retired Layne's No.22 and Walker's No. 37. * How much more of an exclamation point can you get when there could be three numbers retired in the NFL, on the same team, that all went to one High School, this one Highland Park High School in Texas? I don't know much about the history of Highland Park High School in Michigan, but I have a feeling it doesn't compare to the one in Texas. Other athletes that attended Stafford's alma-mater include: Olympic Gold Medalists David Browning (1952, Diving), Mike Heath (1984, Swimming), Harrison Frazar (Pro Golfer), Kyle Rote Jr. (NASL Soccer), Clayton Kershaw (LA Dodgers) and Chris Young (New York Mets). In my mind, there will always two questions that remain unanswered. Would the Lions even have Stafford if Joey Harrington had a stable head coaching staff in place like Stafford has with Jim Schwartz? Would Harrington have fared better with a good offensive coordinator like Scott Linehan? Harrington's tenure in Detroit saw both spots turn into a revolving doors that led to the unrest and lack of stability in both areas. But I have a feeling that Lions fans don't care anymore. They just want to see the team improve on their 1-10 post-season mark since 1958 and finally get that gorilla off their back as one of the four teams that haven't reached a Super Bowl. The only thing that Stafford and Harrington have in common is that Joey is a College Football studio host for Fox Sports on Saturdays while Matthew plays 14 games a year for the NFL on Fox. Labels: Bobby Layne, Clayton Kershaw, David Browning, Doak Walker, Erik Kramer, Harrison Frazar, Highland Park High School (Michigan), Highland Park High School (Texas), Kyle Rote Jr.